The stylish Joie Aire Twin Stroller is ideal for travelling with two. With 2 seats that recline independently of each other, Aire keeps both your passengers happy when they’re on opposite schedules. There’s even a lie-flat setting, making this stroller suitable from birth. The high quality aluminium chassis is lightweight and durable, with all round suspension suitable for rides over rough roads. The front wheels can swivel for easy steering, and lock when you need to push on over uneven surfaces. ShoeSaver brakes can be applied in a single, easy step, protecting your shoes from excess scuffing. 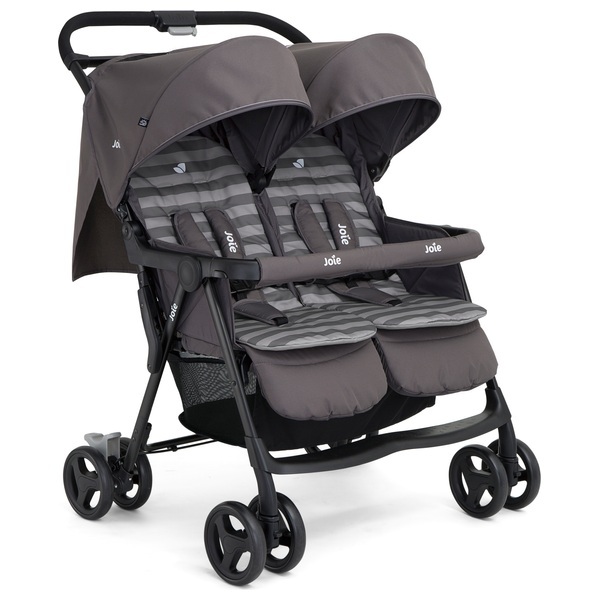 The Joie Aire Twin Stroller features one-hand fold with an automatic lock, for a quick fold on the go. The 5-point SoftTouch safety harnesses are perfect for energetic riders, offering a safe and snug fit with soft and gentle covers. The harnesses adjust to three different heights and the leg rest features multiple psitions, ensuring your little ones can relax in individualised comfort. The Joie Aire Twin Stroller includes seat liners, a raincover, hoods and a large mesh shopping basket.